It was 1917. Canadian soldier Will R. Bird was sleeping in a foxhole near Vimy when he felt a tug at his arm. He awakened and was startled to see his brother Steve beckoning. Steve had gone missing at the front the year before and was presumed dead. Yet there he was, jerking his thumb at ruined houses some distance away. Bird scrambled out and tried to follow his brother but soon lost sight of him. Giving up, he found another shelter and spent the rest of the night there. The next day, he learned a shell had exploded right over where he’d originally been sleeping. The other two men who’d been with him were dead. Bird would go on to write a memoir attributing his survival to his brother’s ghost. Bird’s is just one of the many ghost stories Kyle Falcon discovered through the course of his doctoral research on spiritualism and what was called psychical research during and in the years after the First World War. Falcon, who recently completed his PhD in history at Wilfrid Laurier University, says belief in ghosts and the supernatural was widespread. Spiritualism, essentially the belief that human personalities survive death and can communicate with the living, arose as a movement in the mid-19th century. An accompanying movement was psychical research, which attempted to investigate the supernatural from a scientific lens. “In an age of supposed scientific rationalism, spiritualism was a more scientific religion – something that could be proven, not just taken on faith,” says Falcon. A noted believer was Sir Oliver Lodge, a physicist who was involved in the development of radio. Indeed, the rise of wireless telegraphy and radio, in which information is transmitted invisibly through space, may have been a factor in the growth of spiritualism, says Falcon. A more important factor, however, was the Great War. “Seven hundred thousand men from Britain died in the First World War, and about half had no identifiable remains, so there were a lot of grieving people trying to contact their dead relatives,” said Falcon, who focused his research primarily on British spiritualism. Although there is no record of soldiers conducting séances in the trenches, spiritualist beliefs made their presence known at the front too. Bird’s story is just one example – many soldiers claimed they saw ghosts or received supernatural protection, and at least one British colonel tried to use a Ouija board to discover German positions. As spiritualism gained favour, particularly in the middle and upper classes of the English-speaking world, so did a multitude of ways of trying to contact the spirit world. Automatic writing involved using a planchette, a piece of wood on casters with a hole through which a pencil was inserted. The user would put his or her hand on the planchette and attempt to let spirits guide the pencil. Other people used Ouija boards, or talking boards. A group of participants would put their hands on a planchette together with the idea that spirits would guide it towards letters, numbers or words that would communicate messages from the dead. Spirit photography was especially popular. Clients would go to a photographer who would “magnetize” the photographic plates, sometimes with the aid of a medium. The photographer would take a picture of the client and, when the photo was developed, there would be a ghostly image in the background, surrounded by a gauzy or smoky “ectoplasm,” purported to be spiritual material. The ghostly image was typically blurry but clients often recognized dead loved ones. Spirit photography faded in popularity after the 1920s. A British newspaper examined a spirit photo taken at a cenotaph and concluded the many faces in the picture belonged to living athletes. Other spirit photographers were also exposed as frauds taking advantage of double exposures. Perhaps the most common way to try to communicate with spirits involved attending a séance presided over by a medium who would go into a trance and be overtaken by a spirit who would speak through her. A number of people, including the escape artist Harry Houdini, were active in exposing these as frauds involving stage magician tricks such as objects being “levitated” with the feet or head. The majority of mediums were women. Other than simply being too busy, this may be one reason why soldiers did not hold séances in the trenches, says Falcon – soldiers had to uphold their masculinity. Even so, one reason spiritualism was popular among women may have been that it gave them an outlet for creativity, says Falcon, noting some mediums started out as writers or actresses. After the Second World War, however, more opportunities arose for women. Therefore, changing attitudes towards gender may have been a factor in the decline of spiritualism. Spiritualism is not dead – spiritualist organizations and churches continue to operate today. However, its mainstream appeal is now much reduced. In addition to changing gender roles and efforts to debunk mediums and spirit photographers, ideology was an important factor, says Falcon. Nonetheless, spiritualism was important in the historical context of the First World War and its aftermath, says Falcon. 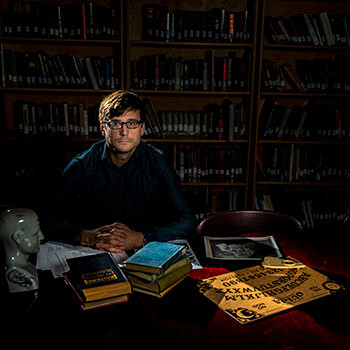 Although he has personally never seen a ghost, attended a séance or attempted to use a Ouija board, he emphasizes his research is not about proving or debunking spiritualism. Kyle Falcon received funding for his research from various sources, notably the Social Sciences and Humanities Research Council of Canada, the Tri-University Graduate Program in History, Laurier’s Faculty of Postdoctoral and Graduate Studies and the Laurier Centre for Military, Strategic and Disarmament Studies.